It’s difficult to find nature amidst the rush, bustle and electronic pop-ups that flood our modern lives – to leave stress and hurry behind, embracing the simple pleasure to be found in pounding waves, a roaring campfire and a sky full of stars. But nature isn’t as far away as you think. 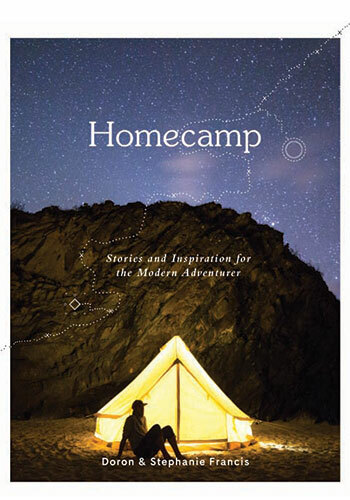 Homecamp is a beautiful collection of stories and images from everyday adventurers – people who have found ways to experience and embrace the outdoors, on their terms. Some have gone on epic adventures: sold their belongings and lived in a van, trekked through the Himalayas or biked across continents. Others simply found new ways of seeing the world around them: cleaned up a beach, learned how to forage or spent a night alone in the woods. All found that their experiences in nature transformed their lives and freed them, even if only briefly, from the monotony of their 9-to-5 grind. This book will inspire you to rediscover the joys and the rejuvenating power of spending time outside. Along with compelling stories, interviews and imagery, you’ll find a how-to guide full of helpful tips, from how to choose and set up camp to brewing the perfect campfire coffee and enjoying the outdoors without a trace.